Beetroot is a hard, sphere shaped root vegetable characterized by dark purple skin and a distinctive purple flesh. Beet includes a unique salty-sweet flavor. It is excellent source of Vitamin C & Folate and B Vitamins and Minerals like Potassium, Magnesium, Iron, and Zinc & Manganese. 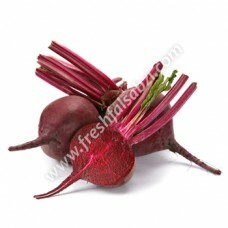 Beetroot helps to stimulate the liver's detoxification processes. It is rich in fiber, exerting favorable effects on bowel function, which may assist in preventing constipation and help to lower cholesterol levels too.